The mission of the residency is to prepare the graduate optometrist to start and succeed in privately practicing in the specialty area of pediatrics and vision therapy integrated into a typical primary care setting. The resident will obtain advanced experience including, but not limited to, clinical, social, and business aspects of successfully practicing in this area of optometry. Graduates of the residency will be uniquely suited to successful private practice. Objective: The resident will develop the clinical skills necessary to efficiently examine, diagnose and treat the child/special populations with functional vision disorders. 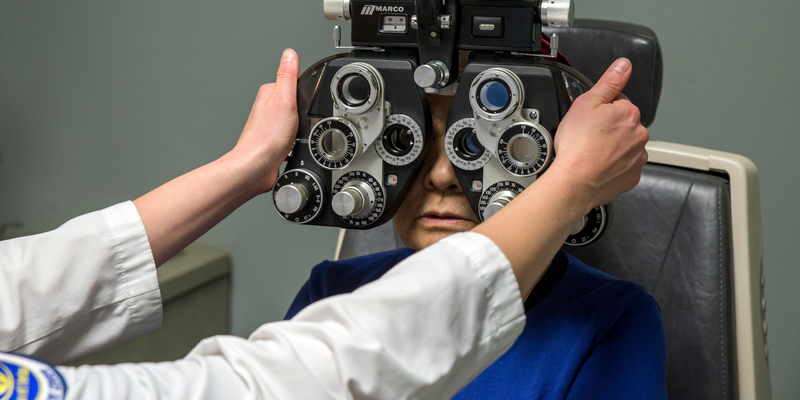 Outcome: The resident will provide primary eye and vision care services involving a minimum of 1500 patient encounters, 33% of which will include obtaining a case history, performing a full functional/behavioral evaluation in addition to the routine optometric examination. These encounters will include but not be limited to: strabismus, amblyopia, and non strabismic binocular disorders. (NSBD) NSBD include suppression of binocular vision, accommodative dysfunctions, vergence dysfunctions, and visually related learning disabilities. Additionally, management of autism, AD(H)D, and brain injured patients will be evaluated and treated. Measure: The resident will report the number of patient encounters of this type using the activity log. Goal 2: Strengthen the resident’s expertise in the diagnosis and management of functional vision disorders. Outcome: The resident will consistently select and successfully perform the proper diagnostic procedures for each patient. Measure: The resident will be evaluated quarterly by the supervisor to determine if the appropriate level of technical and cognitive ability is being exhibited. Objective 2: The resident will determine the correct diagnoses for each patient. Outcome: The resident will consistently select the correct diagnosis for each patient with increasing independence as the residency program progresses. Measure: The resident will be evaluated quarterly by the supervisor to assess the appropriateness of the resident’s diagnostic ability. Objective 3: The resident will determine the best management based on the diagnoses. Outcome: The resident will consistently devise an appropriate management plan for each patient in order to best address the patient’s needs. Measure: The resident will be evaluated quarterly by the supervisor to assess the resident’s management skills. Goal 3: Develop the resident’s communication skills that are required for successful provision of services in pediatrics and vision therapy. Objective : The resident will develop expertise in establishing rapport and communicating with pediatric patients and their caregivers. Outcome: The resident will consistently demonstrate the ability to effectively communicate with patients and their caregivers. Measure: The resident will be evaluated quarterly by the supervisor to assess the resident’s communication skills. Goal 4: Develop the resident’s skills in training ancillary staff, particularly vision therapists. Objective: The resident will train ancillary staff in the techniques necessary to assist optometrists in providing vision therapy and other clinical techniques. Outcome: The resident will perform at least one training session for ancillary staff per month. Measure: The resident will report on the number and content of these training sessions using the activity log. Goal 5: Develop the resident’s understanding of the business and accounting aspects of successful management of a practice devoted to children, rehabilitation, and vision therapy. Objective 1: The resident will become familiar with the encounter/billing forms, and clinical chart recording requirements for proper billing. Outcome: The resident will log accurate diagnosis ICD codes, as well as appropriate office visit billing codes on the patient billing form. Measure: The results of regular review of the resident's billing/encounter forms by the Supervisor or attending doctor at Child and Family Eye Care will be reflected in the quarterly resident evaluations. Objective 2: The resident will understand basic accounting reports and established benchmarks related to management of a successful private practice. The supervisor will respond with a written response to the resident’s analysis to improve analytical skills. Goal 6: Develop the resident’s skills in presenting topics to fellow professionals. Objective 1: The resident will acquire and practice skills needed to effectively present information to other professionals in group settings. Outcome: The resident will present lectures during meetings of the clinic or other health care providers. The resident will, when possible, also present posters or lectures in other settings such as the College of Optometrists in Vision Development, the American Academy of Optometry, SECO, AOA or other such meetings. Measure: The resident will report monthly on these types of activities using the activity summary. Objective 2: The resident will acquire and practice skills needed to effectively present information to ancillary professionals. Outcome: The resident will present lectures to personnel in local nursing schools, VA facilities, Rehab hospitals, or universities regarding salient topics in pediatrics and rehabilitation. Goal 7: Instill in the resident an appreciation of the importance of scholarly activity. Educate the resident in the preparation of a professional manuscript. Outcome: The resident will prepare a publication-quality manuscript on an approved topic. Measure: The resident will complete the manuscript by the designated completion date. Learning Activity: The resident will provide primary eye and vision care services involving a minimum of 1500 patient encounters, 33% of which will include obtaining a case history, performing a full functional/behavioral evaluation in addition to the routine optometric examination. These patient encounters will include strabismus, amblyopia, non-strabismic binocular disorders, autism, AD(H)D, and brain injured patients. Outcome: The resident will develop enhanced skills in the management of primary eye and vision care patients as mentioned above. Objective: The resident’s expertise in the diagnosis and management of functional vision disorders will be enhanced. Learning Activity: The resident will provide services to a significant number of patients with refractive, physiologic and pathologic conditions of the eye and vision, particularly in areas of a functional/behavioral evaluation in addition to the routine optometric examination. The resident will formulate a diagnosis based on the results of the procedures performed. These encounters will include but not be limited to: strabismus, amblyopia, and non strabismic binocular disorders. (NSBD) NSBD include suppression of binocular vision, accommodative dysfunctions, vergence dysfunctions, and visually related learning disabilities. Additionally, management of autism, AD(H)D, and brain injured patients will be evaluated and treated. Outcome: The resident will become highly proficient in the performance and interpretation of basic and advanced ocular examination techniques on patients with complex ocular and vision anomalies and will attain advanced skills in the management of these patients. Objective: The resident will develop expertise in establishing rapport and communicating with pediatric patients and their caregivers. Learning Activity: The resident will communicate with patients and their caregivers during the performance of examinations, therapy sessions, and counseling sessions. Outcome: The resident will be able to communicate with patients and their caregivers in a manner that results in positive clinical outcomes and enhanced patient compliance. Learning Activity: The resident will provide training to staff in techniques relevant to optometric practice with an emphasis on vision therapy. Outcome: The resident will be able to train staff to efficiently assist optometrists in the provision of patient care, including vision therapy. Objective: The resident will be responsible for recording the proper assessment and management plan and indicating the correct diagnostic and procedural codes for each patient. Learning Activity: The resident will record essential findings and supporting assessments and management plans for each patient encounter in the clinical record and appropriate forms. Outcome: The resident will gain a thorough understanding of proper coding. Learning Activity: The resident will present at least one lecture per quarter to the clinic or another staff/group and when possible will present posters or lectures in other settings such as the College of Optometrists in Vision Development, the American Academy of Optometry, SECO, AOA and other such meetings. The resident will also present topics to ancillary professionals. Outcome: The resident will develop skills in providing effective presentations to health care professionals. The resident will engage in scholarly activity. Learning Activity: The resident will prepare a publication-quality manuscript on an approved topic that will be reviewed and critiqued by the supervisor. Outcome: The resident will develop an appreciation for scholarly activity and its importance to the profession. A. All applicants must complete the SCO application and return by January 30. Supporting documents should be submitted to the Director of Residency Programs of Southern College of Optometry no later than January 30. This program uses Optometry Residency Match (ORMatch). Applicants must complete the ORMatch application by the SCO deadline of January 30, to be considered. Applicants are responsible for ensuring that all supporting documentation is submitted to each entity involved, e.g., the College, ORMatch, and the residency site supervisor. You must have passed NBEO Part I, II and TMOD in order to apply to one of our programs through ORMatch. You must have passed NBEO Part III and ISE (if applicable) in order to begin an SCO affiliated residency program. Those applying to a VA hospital or a state that does not require TMOD to obtain licensure are an exception if TMOD is not passed on first attempt. B. Applicant must have earned an O.D. degree, or will have earned such a degree by the time of matriculation from a school/college of optometry accredited by the Accreditation Council on Optometric Education. C. Applicant will furnish an official transcript from his/her school/college of optometry. An applicant should have a cumulative grade point average greater than 3.0 on a 4.0 scale in the professional optometric curriculum. D. Applicant must pass all parts of the National Board of Examiners in Optometry examinations required for state licensure and furnish official transcripts when available. If accepted, the resident is expected to obtain a state optometry license. E. Three letters of recommendation are required. The College affirms that no person shall be excluded from participation in, be denied the benefits of, or be subjected to discrimination under any program or activity at or affiliated with Southern College of Optometry on the basis of race, color, creed, religion, gender, age, disability, or national origin. All applicants selected for admission must sign a standard letter of intent. Each residency is one calendar year in length, commencing July first. The resident is eligible for thirteen days annual leave. The resident is also eligible for educational leave to attend approved professional meetings. Annual and educational leave is granted with prior approval of the Supervisor in conjunction with the SCO Director of Residency Programs. A. The resident is defined as an employee of Child and Family Eye Care and the residency stipend is paid by the Child and Family Eye Care. No tuition or fees are applicable. B. The resident should apply for optometric license in Kansas prior to the beginning of the residency. C. Professional liability protection for residents for professional activity performed at Child and Family Eye Care, is provided by Child and Family Eye Care. D. Residents will be required to present credentials according to the Southern College of Optometry policy for credentialing of residents. E. Resident privileges will be determined by Child and Family Eye Care. A. The resident is required to deliver clinical services at a level that is satisfactory to the Residency Supervisor, Director of Residency Programs, SCO, and Child and Family Eye Care. Normal clinic hours are from 8 A.M. until patient care is complete usually 5:30pm with a scheduled lunch break. Tuesday and Thursday patient care runs from 10am-7pm with a designated lunch break. Wednesday is devoted to VT and Rehab Hospital consults from 8am-5pm with a scheduled lunch break. Fridays will be possible additional clinic hours, lectures, and training time with Dr. Pirotte. The resident is expected to be present in the clinic during all scheduled working hours, except when attending or delivering lectures or doing study or research. The resident will occasionally be required to be on call. B. The resident is required to keep a record of patient contacts. The Supervisor of the Residency Program and the Director of Residency Programs will review the resident’s activity periodically. C. The resident is required to write a publication quality paper based on original research, literature review, or a clinical case. D. The resident will be required to deliver an oral presentation at the annual Resident Weekend, held on the campus at SCO. E. The resident is expected to perform in a professional manner in the delivery of patient care services and to observe those proprieties of conduct and courtesies that are consistent with the rules and regulations governing Child and Family Eye Care, and Southern College of Optometry Residency Programs. F. The resident is required to participate in and complete the requirements set forth in the curriculum. G. Upon successful completion of the Residency Program, the Residency Supervisor and the Director of Residency Programs will recommend the granting of certification to the Vice President for Academic Affairs. H. Any resident accepted for training can be dismissed, without receiving a certificate of completion, for infractions of the rules and regulations of Child and Family Eye Care, or those set forth by Southern College of Optometry, or for any action which jeopardizes the safety of patients, personnel, or physical facilities. I. The resident must acquire and maintain a Kansas State Optometric License, in good standing, in order to be granted a residency completion certificate. A resident rotating through a hospital based (or similar) residency program must adhere to all facility policies and procedures, including but not limited to, receiving all required immunizations or showing appropriate medical documentation that he/she is in full medical compliance with required immunizations. In addition, if a resident cannot receive a flu or similar immunization due to potential allergic reaction, medical documentation must be made available to the Program Supervisor prior to the program's start date. A resident should receive the required immunizations provided by the facility when appropriate. Otherwise, any costs incurred will be the resident's responsibility. Any grievances should be submitted in writing to SCO's Director for Residency Programs utilizing the procedures found in the Residency Handbook. A residency stipend will be provided for the year of training paid by the clinic. The stipend is currently $36,000. Compensation is not contingent upon productivity of the resident. Additional benefits such as FICA and professional liability insurance are also funded by the clinic. The resident will have the opportunity to purchase health insurance through Child and Family Eye Care. Moonlighting is defined as employment outside of the residency during the term of the residency. Moonlighting is permitted while enrolled as a resident in this program ONLY with prior approval of the program supervisor. Moonlighting is not permitted to interfere with or be substituted for any assigned residency activity. The residency program at Child and Family Eye Care is fully accredited by the ACOE, 243 N. Lindbergh Blvd., St. Louis, MO 63141, 314-991-4100. Upon satisfying all the requirements for completion of the program as determined by the Supervisor of the Residency Program and the Director of the Residency Programs, a Certificate of Completion will be awarded to the resident by Southern College of Optometry. The resident reports to the Supervisor of the residency program. The Supervisor reports directly to the SCO Director of Residency Programs who in turn reports directly to the Vice President for Academic Affairs at Southern College of Optometry.